There’s a cold, hard truth about Pinterest: You can pin all the projects and recipes you want but, without the skills, time, or motivation, you’re left with no more than a few online boards stocked with pretty photos and nothing to show (your mom) for your efforts. As someone who’s never been much of a DIYer, I appreciate brands and startups increasingly catering to a new type of consumer – those, like me, who prefer to conserve energy with instant access to desired products and services with the tap of an app. I can get groceries delivered with InstaCart, hop an Uber to my next destination, and have Washio take care of my dry cleaning. If I’m looking for a unique furniture piece for my apartment, I can turn toCustomMade, and I can wow my friends with a four-course dining experience courtesy of Feastly chefs. A couple of key trends contribute to this new “Do it For Me” or DIFMe segment of consumers. One, is the collaborative economy (aka the “sharing economy”). The collaborative economy connects consumers to each other, via the startups and brands that enable them, to borrow vs. buy, rent vs. own, and use pre-approved networks of contractors and other sharers to enjoy products and services on-demand. Participating in the collaborative economy makes it easy for consumers to throw out DIY attitudes to save time (and, sometimes, even money) in everyday life by harnessing the power of the crowd. The Internet of Things is another enabler that takes things one step further, into the realm of before-demand delivery. When the smart, sensor-filled objects around us communicate, they quickly learn our preferences, patterns, and behaviors. The result is increased support of the DIFMe lifestyle. Rather than having to manually request a product or service on my own, connected products use predictive analytics to solve problems before I realize I have a need. 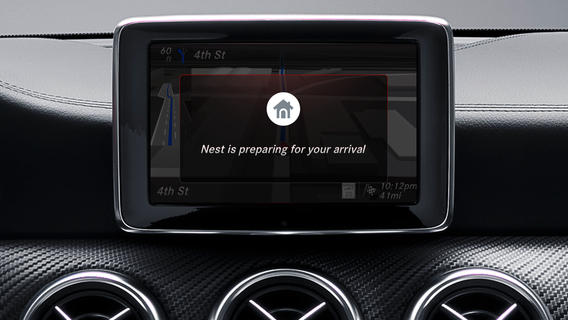 Nest application display in Mercedes-Benz console. Take Mercedes-Benz for example. The luxury car brand recently partnered with smart home control product Nest to enable its cars to communicate with Nest thermostats. When a driver arrives or leaves the house, his or her Benz signals to the home’s Nest, adjusting the temperature accordingly. Because, who wants to be bothered with having to turn down their home’s temperature from their smartphone, when your car can simply communicate for you? If this seems far-fetched (or at the very least, quite niche), that’s because it is for most. According to Acquity Group, only 7% of consumers own an IoT device and a mere 4% own one in home. But, that doesn’t mean companies aren’t seeing preliminary results. Besides bettering customer experiences, Harvard Business Review reports that executives who are “early adopters” of IoT witness a myriad of benefits of other benefits that include enhanced customer service (51%), increased revenue from service/products (44%), and more information to feed big data/analytics efforts (35%). The last goes hand-in-hand with a challenging privacy roadblock in achieving greater consumer adoption. When brands begin to collect and analyze consumer data via IoT networks, they face strict standards (both legally and in the court of public opinion) to ensure data is handled securely. Early adopters and younger generations may be more willing to trust their data in the hands of brands, but companies have a long way to go where the general populace is concerned. Until more customers begin to adopt connected products as part of their lifestyle, and relinquish data control for its benefits, companies face an uphill battle. TRUSTe reports that the vast majority of consumers (79%) are concerned about the idea of their personal information being collected by smart devices. And, another 69% feel they should own their on-device data. Brands must be wary when walking the fine line between seamless experience delivery and breaking consumer trust. Just because users are willing to share their data to save time and energy in their connected lives, doesn’t mean it’s a free-for-all. Companies can avoid customer frustration by clearly outlining what data they’re collecting, how often, for what purpose, and whom they’re sharing it with. Transparency is key to heightened customer engagement, satisfaction, and, ultimately, retention.